Kevin Murray is a petrolhead with a very interesting day job: he runs a company designing high performance gear for clients like The North Face, Nike, Mammut and Navy SEAL teams. 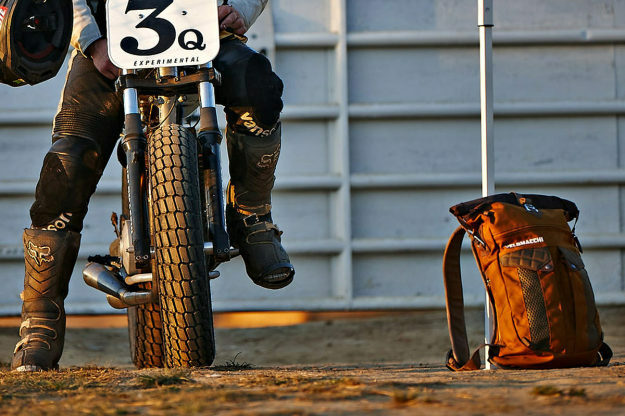 He’s now set up shop with his own brand, Velomacchi, producing “Everyday Carry for the serious motorcyclist.” In the works are backpacks, tool rolls, iPad and iPhone storage and messenger bags. 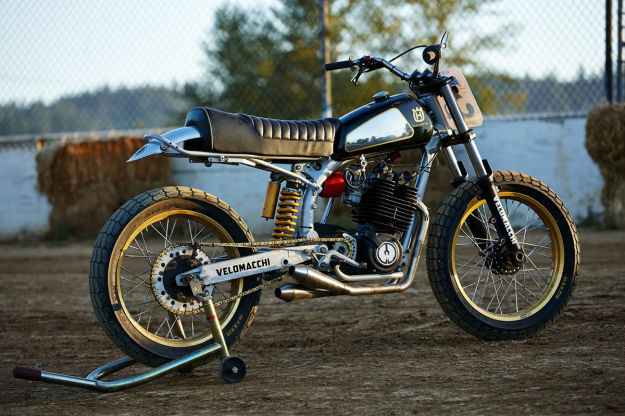 The vibe is ‘privateer racer’—functional and good value. 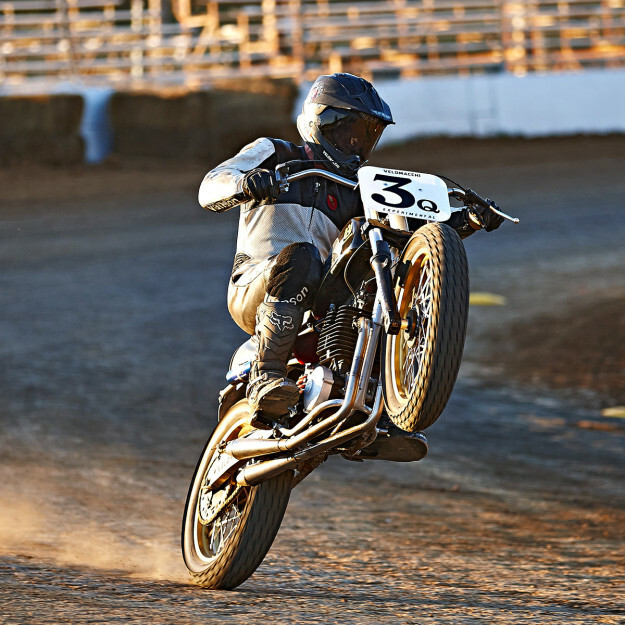 It’s a very technical process, so Kevin gets his respite via the more analog pursuit of crafting vintage dirt bikes. 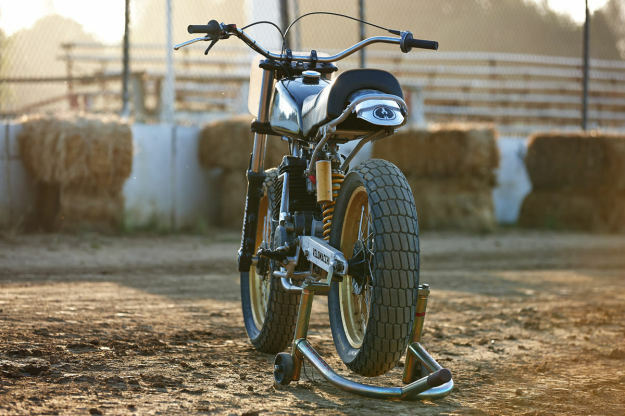 Like this stunning Husqvarna dirt bike, based on a 1986 510 pulled from a hedge in eastern Oregon. 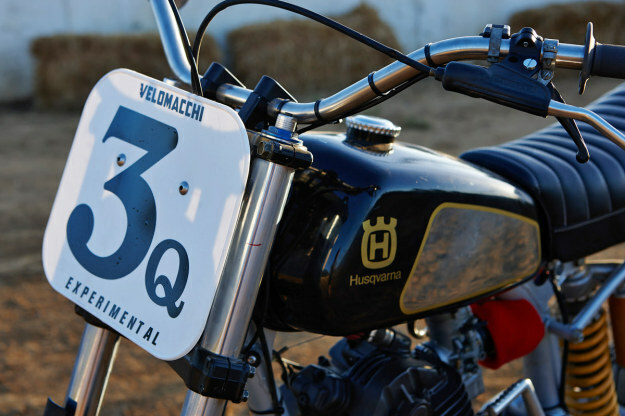 The Husqvarna dirt bike had two serious weaknesses though: a Motoplat electrical system and a temperamental Dell’Orto 40mm carburetor. So Kevin and his crew replaced the electrical system with a German-designed MZB ignition, and installed a new Mikuni 38mm flatslide carb for a snappier throttle response. 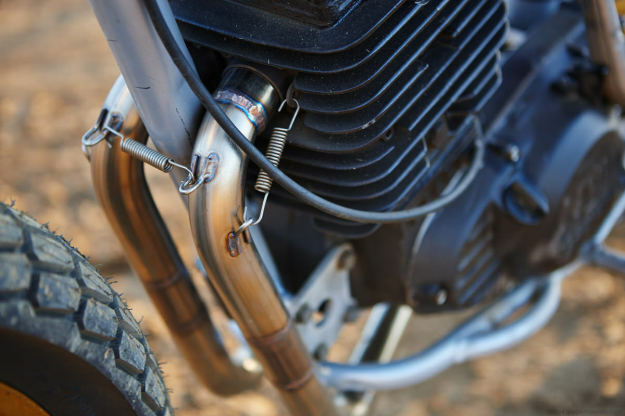 The exhaust system is a traditional low-slung flat track design, with stainless 2-into-2 cone silencers. It’s low slung on the right to avoid exhaust burns on the thigh when turning left, and also to save it from damage in a lowside crash. An added dose of style comes from the new bodywork. 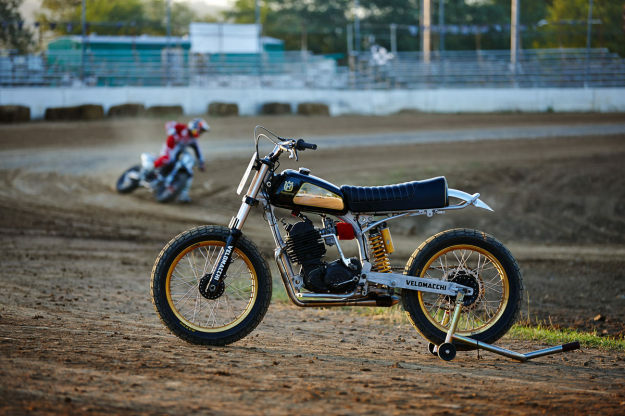 “We really loved the lightweight simplicity of Husky’s 1970s desert racers. So we kept the frame, engine and swing arm from the 510 and tossed the heavy plastic fairing, tank and seat. We replaced it with a brand new tank from a 1979 Husqvarna 390 OR, and a custom seat from New Church upholstery.” The seat is not fashionably slim, but it sure looks comfy. Now that the Husqvarna dirt bike is fully sorted, Velomacchi’s focus is back onto the gear. And very interesting it looks too, providing a challenge to the likes of Kreiga and Ogio. Funding for the project has just launched on Kickstarter, and investors are piling in already.